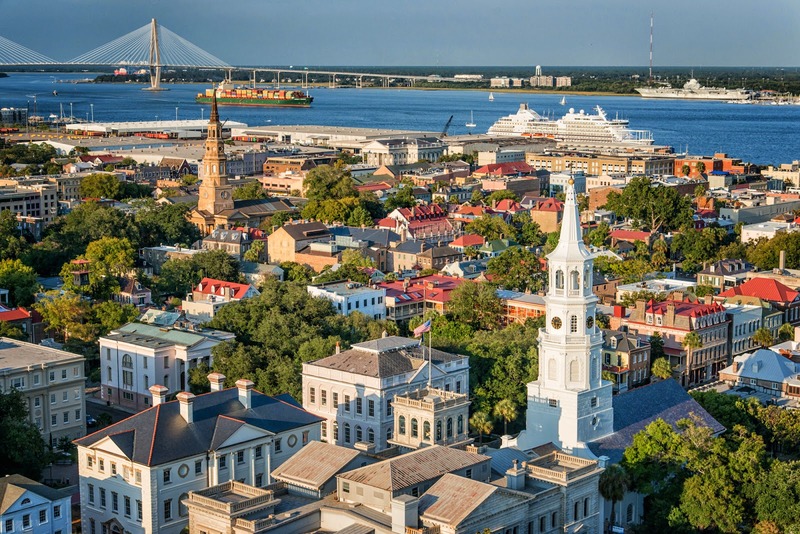 Next month, we are thinking about heading south for a long weekend to pay Charleston a visit! This is a city that both of us have been wanting to visit for a couple years and it's been a little bit since I've taken a trip (you know how I am about this...), so we are really excited about it. The city seems so charming and beautiful! For those of you who have visited before or live around the area, what should we do on our stay? Any recommendations on the best places to eat and things to do/see? 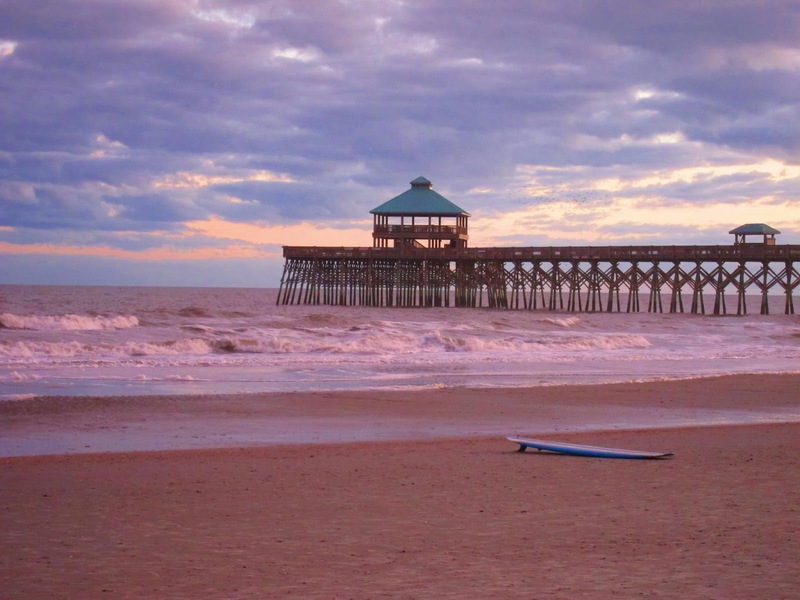 We definitely want to go to Folly Beach, eat as much southern food as we can, and do all the "touristy" things downtown. We are staying at Kings Courtyard Inn right in the historic district (so cute! ), and it's pet friendly which means our little Rocky is coming with us! Thank you in advance and to those who have already emailed me recommendations! Erin (two thirds hazel) just did a post on her recent trip to Charelston!! Her pictures are gorgeous and I'm sure you'll get some ideas! All this travel talk today is making me want to go somewhere....baddddd!!! Kinda jealous! 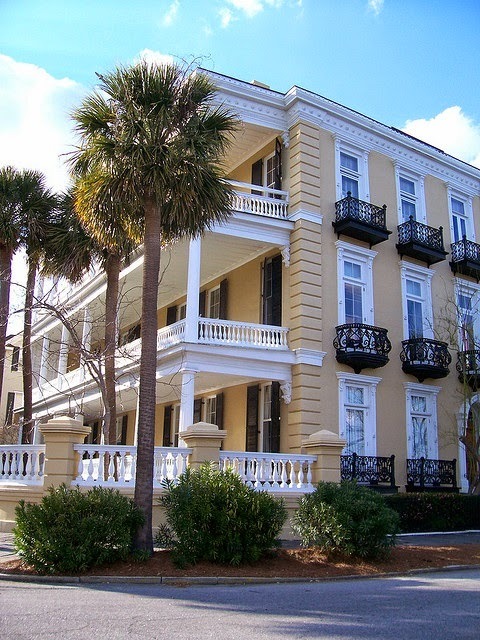 SO want to visit Charleston one day! Hope you have a great time! When are you going?! We are going July 29-Aug 2!! I am so excited about this post as myself and 3 of my girlfriends are taking a "Mom's trip" to Charleston in September and staying for 4 days!! Our flights are booked and we decided to stay at the Harbourview Hotel in the downtown area. We are also going to visit Folly Beach. I do know that the beach is a 30 or so min taxi drive from the downtown area not sure if you guys are renting a car. We are also interested in doing a mansion tour. You definitely have to eat at Fleet Landing (http://www.fleetlanding.net/), such a neat atmosphere and really delicious southern food and seafood! We're doing a family vacation to Folly Beach next month, and I'm SO excited! Charleston is awesome. I keep trying to convince my husband we should move there. Perfect blend of beach life with historic charm. I remember going to The Charleston Hotel (now the Belmond Charleston) and swearing that I was going to get married there - it's so beautiful! You must and I mean MUST have brunch at Lost Dog Cafe in Folly Beach. Go early & plan to wait. It's very popular! Think mason jars drinks, southern food, pictures of people's dogs covering the walls. Folly is about 30 minutes away from Charleston & gets extremely heavy traffic heading in the 2-lane highway on the weekends. Another MUST do is the Market Pavilion Hotel rooftop! Stunning views of the entire city. Grab some appetizers & mocktails while you enjoy the view and all the "pretty people" watching!! I swear that city is chock full of pretty people! :) You will fall in love with the city....everyone does...and you will become a repeat visitor every year!! For a great meal in Charleston I highly recommend Coast. Our friend is a local and we asked her to take us where locals eat and she took us to Coast. Such amazing food and a great atmosphere. Additionally there is a great gelato/cannoli shop right around the corner. Have a wonderful trip! Oh also do the horse & carriage tour of the city....you get to see all the best spots that way, like the amazing houses on The Battery & Rainbow Row. Stop by & shop in the City Market (former slave market). Try to eat dinner @ Husk sometime - written up in Southern Living all the time! Charleston is adorable. I have food reccomendations! Jestine's Kitchen is a great, authentic casual spot (famous for the fried chicken, amongst others) http://thethreebiterule.com/as-southern-as-fried-chicken/ and 82 Queen is such a lovely spot for dinner http://thethreebiterule.com/guest-post-82-queen-in-charleston-sc/ If you find any boiled peanuts they're worth a try...very interesting for those who didn't grow up eating them! Yes to Hominy Grill!! Best shrimp & grits!! Hey girl! I am from Charleston so I am so excited that you are heading there. It is amazing!! I did read earlier on up that someone mentioned Lost Dog; although I have never been, my husband has and LOVES it. I will say that Folly Beach is a bit hippy and old time beachy. If you want quiet and GORGEOUS houses, check out Sullivan's Island and be sure to check out Poe's Tavern. If y'all like burgers this is the place to go. They also offer every burger the same but with a chicken option. Great beers for your hubby, awesome ambiance, and the fries are TOO DIE FOR! Coast is an AWESOME restaurant on John Street. Must check it out. THE best paella in my personal opinion. There seafood is abounding. If you want hole in the wall, fried southern seafood, check out the Wreck in Mt. Pleasant off Shem Creek. It is fabulous....fried hominy..my mouth is watering. And then Shem Creek is GREAT for outside cocktailing, boat watching, and is a local favorite. Hope y'all enjoy!!!! Don't hesitate to email me (haleymarozas@gmail.com) if you have any questions. I am from Charleston (born and raised) and live about 3.5hrs north of there. My parents still live there and I am constantly down there with my husband. That's close to me!!! :-) Have fun! There so much to do and see and eat - you really can't go wrong. Have fun!!! How fun! I just went to Charleston for a week at the end of May (wrapping up my week of playing with my friend's wedding). For food, we did lunches and dinners at Hall's Chophouse, Poogan's Porch, Amen Street Fish & Raw Bar, and Fleet's Landing. I really wanted to make it to Fig, but it didn't happen. We did, however, eat breakfast pretty much every morning at Caviar & Bananas while we were there. We also loved Market Pavilion's rooftop bar and Closed for Business for a quick spot to grab a drink and a bite to eat. If you want something active, we did a kayak trip out in Charleston Harbor and loved it. Fort Sumter took a little longer than we anticipated so we didn't quite make it out to Kiawah Island like we had wanted to do. Enjoy your trip girl, I wish I could be back in Charleston right now. Next on our list is Savannah since my little sister and her fiancee are about to move there. We have friends there and they love it, but we've never been. I hope you guys make it down; I'd love to hear about it. We may move their next year for my hubby's job. Such a beautiful place. Yay for pet friendly hotels!!! Rocky will love it and so will you guys! I just emailed you back and will be getting you our personal recommendations here soon! I've gone to Charleston twice in the past year, and it is amazing. I highly recommend dinner at Slightly North of Broad! It is absolutely fantastic. Just be sure to make reservations - that's pretty much the case for any popular Historic Charleston restaurant for dinner. Have a fun and safe trip. This city looks beautiful, definitely one I want to visit! I love that you have found a pet friendly hotel. That is such a great idea! Charleston is such a beautiful southern town y'all are going to have a blast. Everyone else has made such great recommendations I know your going to have an amazing trip! SNOB is an amazing restaurant and I just love Husk and Poogan's Porch as well. We love Charleston and are headed there for our beach week soon. It is just so fun and there is an abundance of activities to do. Enjoy!! Haley is SPOT ON.. Folly is not my cup of sweet tea, but others love it.. also the Tattoed Moose on east bay is AWESOME!! good to know! I think we will go to Isle of Palms instead :) Thank you!! charleston is my favorite city in all the world and i only live 3 hours away. if you go to folly you MUST go to Lost Dog Cafe for brunch. go to Poe's Tavern on Sullivans Island for lunch...best burgers. Husk or Cypress are really good places downtown for a nice dinner out. I have only been to Charleston for a brief (like 38 hours for a wedding) but you will love it. We went to Hymen's for dinner. The food was good, but their key lime pie was to die for! I consider myself a key lime pie connoisseur and compare all to my mom's and this is the first time I have ever had one that was better than hers! Enjoy your trip! its a beautiful city. I'm from SC and I've been to Charleston a few times over my lifetime. It's seriously one of the most beautiful places ever. We got engaged there so it holds such a special place in my heart! Itheres a really tasty place called Vickery's in Shem Creek (between Charleston and Sullivan's Island) that we love. There's also a place that I call my "secret hideaway" where you can take amazing photos! I can send you the address in an email. It's pretty convenient so you should totally check it out! Totally late in commenting but I wanted to mention just a couple of my must see's for Charleston. Definitely one of my fave places. We always stay in Mt Pleasant b/c we have family there but to travel into Charleston from Mt Pleasant you have to cross the Arthur J Ravenel Jr. Bridge as it connects the two. It's a beautiful site and has a bike/pedestrian path you can take instead of just driving it. A little intimidating but what a view! Also, close to there is the USS Yorktown if you're interested in that kind of thing and of course we always go down to the Battery, check out Rainbow Row and visit the Market. The carriage rides are pretty cool and very informative about the history of the town. I'd sit downwind of the horse if I were you. ;) Honestly, you can't go wrong with just about anything you choose to do. It's a beautiful city so rich in history. Have fun and safe travels!